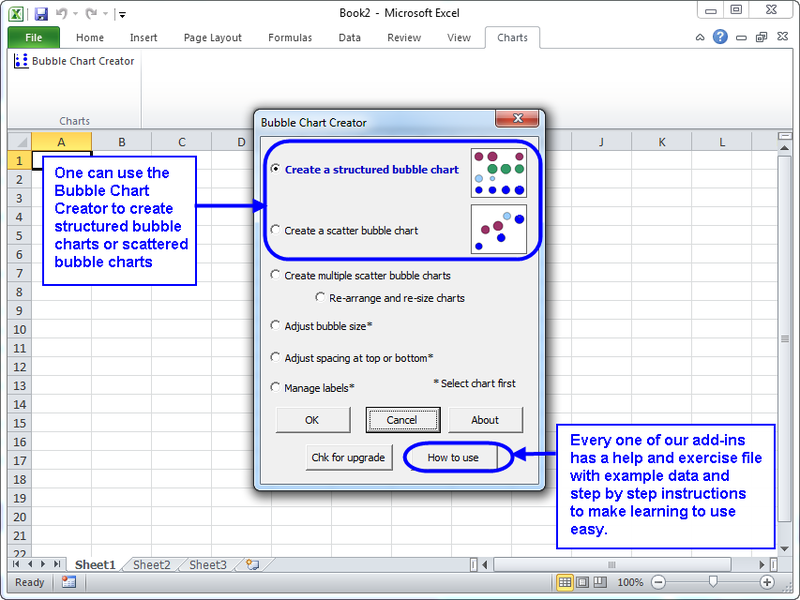 The Bubble Chart Creator add-in for Microsoft Excel makes it easy to create bubble charts, especially bubble charts from tables of data. It is compatible with Microsoft Excel 2007 to 2019 and Office 365. Such a graph allows one to see both differences in market size by year by competitor without having a confusing set of lines or columns to study. By adding individual color to each bubble, this adds a fourth dimension to bubble charts. And, the Bubble Chart Creator allows one to create bubble charts using date values for either the X or Y axis. A great time saving feature of the Bubble Chart Creator is the ability to create many scatter type bubble charts at a time. You can easily create 10, 20, 40, or more bubble charts with just a few clicks.